We have a minimum of 3 nights during weekends and 2 nights during weekdays. Please do not book weekends for 2 nights unless there are only 2 days available. The Nakai Chalet is a spacious 2,320 square feet mountain retreat with 3 bedrooms plus a loft, kid friendly, Convenient and in a Great Location.We have the most comfortable and relaxing private hot tub for 6 with a specialty chair in the Area! and one of the few cabins with AC! 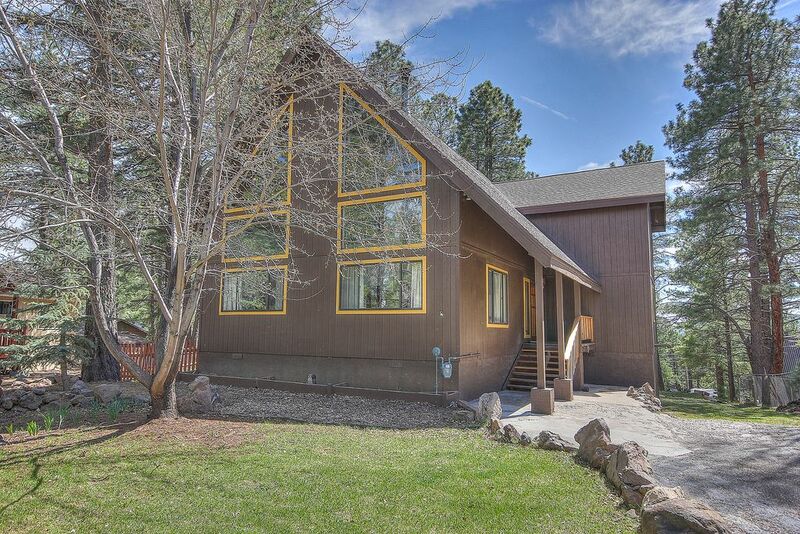 Our custom vacation home is located on a hilltop in a quiet residential neighborhood nestled in tall pines, and surrounded by the Coconino National Forest. The house is equipped with new solid wood furnishings, and decorated with a rustic SW decor.Featuring:Quiet location:The property is nestled in natural landscaping of tall pines, and very close to national forest entrances. It is the perfect holiday lodging for nature lovers and outdoor enthusiasts. Discover the Coconino national forest, Kachina peaks wilderness, Walnut canyon, Sunset crater, Kendrick peak wilderness and the Grand Canyon.Exceptional great room:The living room has a wonderful array of large windows extending up to a 30 ft vaulted ceiling. My husband and I grew up in different parts of the world, but share the same views about what we like. We enjoy outdoor activities in the mountains including hiking, biking and skiing; and also have a passion for dancing, music and art. I enjoy talking to our guests and helping them with the travel arrangements, every time a different adventure! Que bonita es esta vida! We believe this is an ideal location, close to town without the hassle of noise and traffic, located on top of a hilly neighborhood nestled in pine forest. It is also is centered between Sedona and the Grand Canyon. We can plan day trips or enjoy what Flagstaff has to offer. We love our neighborhood, which with find picturesque and very unique. National Forest access point are within 1 mile. We love art, custom and unique things you can see them throught out the house and we love sharing it with you. I am also the entertainer. View more about Clara D.
toilet, shower, Thinking of safety for adults! Not to be used if small children are around. Not the primary source of heat. We have a big room with a pool/ping pong table with a fire stove. Upper balcony deck has grill, outdoor dining set and stairs to fenced yard. Lower deck in back yard with gazebo. Snowbowl is 19 miles from us. Maintain weekly by one of the best hot tubs companies. We changed the water between 2-3 months. The bedroom with the queen bed is in the first floor. But there are steps at the front of the house. there are 2 booster seats. The only reason I’m giving it a 4 star is because I’m a mattress snob with a bad back and the master bedroom sleep number was not good to me. Everything else was perfect. We had all that we needed for a successful stay for a family of 5. This was a wonderful girls getaway! We did bring our kids who enjoyed playing in the snow. There is plenty to do at this cabin. We enjoyed volleyball, ping pong, pool, and the hot tub. The place is large, well stocked, and comfortable! My sister brought karaoke machine as well. We enjoyed our stay at the Nakai Chalet. The kids loved the hot tub, ping pong table and games. The adults appreciated the well-appointed kitchen and baths. Kachina Village is the perfect location for exploring Flagstaff and Sedona. We look forward to returning! Beautiful home for a long weekend! The house was ideal for us (4 friends getting together for a long weekend). It's spacious, clean and nicely decorated and it had everything we needed in the kitchen. We enjoyed playing ping pong and then watching a movie in the living room which is very cozy. The bedrooms are all really comfortable. The 4th bedroom is in the loft and doesn't have much privacy since there are no doors and you have to walk through it to get downstairs - but one friend stayed in the room and didn't mind. The only issue we had was the house is a longer drive to Sedona than we realized - about 45 minutes to 1 hour, depending on our route. Otherwise, we loved it and had a wonderful stay! This house was perfect! Beautiful, comfortable and perfect for families. The owners thought of everything and had lots of nice touches. The jacuzzi and ping pong table provided lots of entertainment. I'd highly recommend this house.